Flowers, decorations and appointments should not be overdone. We have found that the sanctuary does not need numerous floral arrangements. Flowers and ribbons may be placed on pews; however, they must be attached with pew clips or tied on with ribbon or twine. Absolutely no tape may be used on the pews or other painted surfaces inside the sanctuary. The wedding coordinator can provide names of local florists if desired. 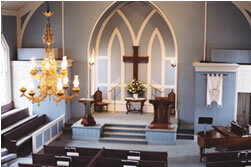 Two brass candelabra and white candles are furnished by the church. If a unity candle is desired, please make arrangements to bring one along. The Wedding Coordinator can give advice regarding the candle(s). Our congregation celebrates the church year with various liturgical enhancements. In particular, the cross is draped with purple during Lent (from Ash Wednesday until Easter), and with white after Easter, for seven weeks. Assorted liturgical banners that celebrate seasons and sacraments of the church hang on the font walls, including a Wedding Banner. Each of these banners is designed and crafted by artists in our congregation and may not be removed, nor may other fabrics be draped on the cross at other times of the year. Moreover, the view of the cross may not be obstructed by large arrangements of flowers or other decorations.